The wonderful downtown view from Bad News Bar makes it a favorite. Of course, the excellent cocktails don't hurt, either. 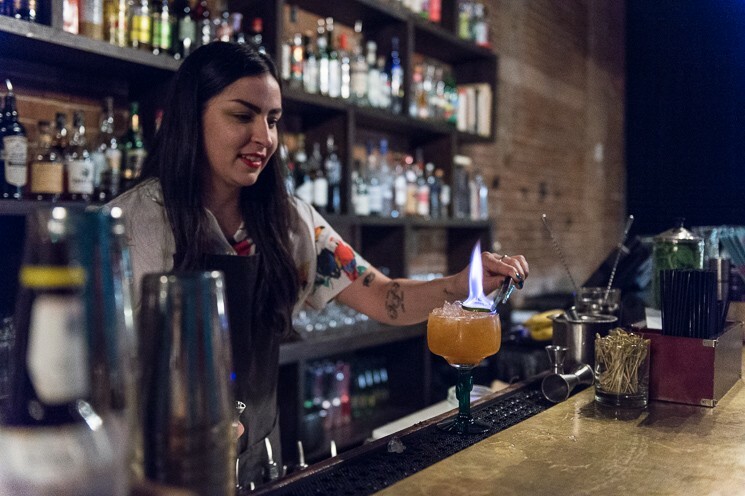 Over the past few years, downtown Houston has been treated to a cocktail revival by way of several quality establishments from highly trained bartenders who honed their craft behind the bar before learning how to be business owners. But a few mediocre bars have cropped up recently, content to serve poorly made drinks with average ingredients. A visitor who doesn’t know any better might wander into one of these places and end up with a tragically incorrect impression of our local bar scene. 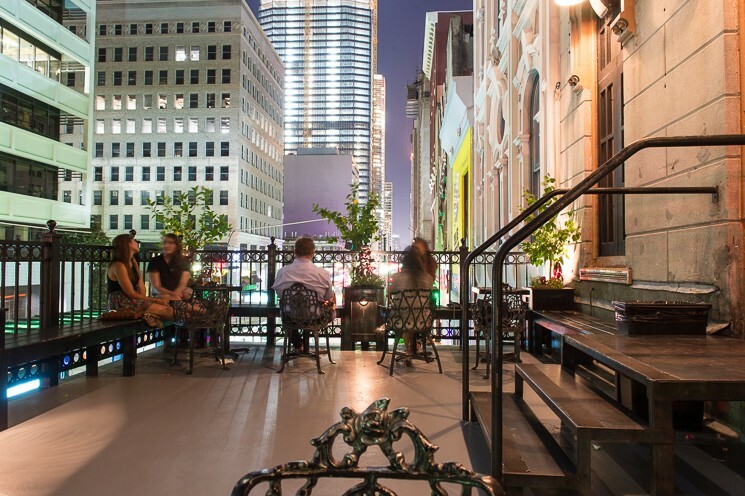 To help avoid that scenario, we’ve put together this list of the places that we think serve the best drinks in downtown Houston. We’ve also included spots for whisk(e)y, wine and beer lovers —and a few for people who just want some no-frills booze. A Future Best? As of this writing, Tongue-Cut Sparrow is still in its soft opening phase and we haven’t even had time to go yet. That said, early word is that this 25-seat bar from longtime bartender Peter Jahnke and serial bar owner Bobby Heugel (of Anvil Bar & Refuge, The Pastry War and more) is really something special. The focus is exclusively on classic cocktails served at their absolute best with service to match. Because the bar is so small, half of the seats are reserved and half are first-come, first-served. To reserve a seat, call or text 713-321-8242. Bad News Bar, 308 Main: If getting there is really half the fun, then find your way to this second-floor bar for a great time. The rewards include expertly crafted classics like the Old-Fashioned (which is only $5 at happy hour), Negronis on tap and a beautiful view of Main Street from the balcony, especially at sunset. It’s common for there to be a line of people waiting to enter as the bar strictly enforces maximum capacity. However, the wait never seems to be too long. Barringer, 108 Main: If you’re more of a lounge person, Barringer is a great option. Their signature cocktail, The Barringer, comprised of whiskey, dry Curaçao, demerara syrup and lemon, gets rave reviews. Another great selection is the Orange Mule, is a mix of tequila, Cuarenta Y Tres, orange, ginger beer and a touch of cinnamon. Sometimes DJs perform here, and they are expert vibe curators that won’t leave your ears ringing the next day. 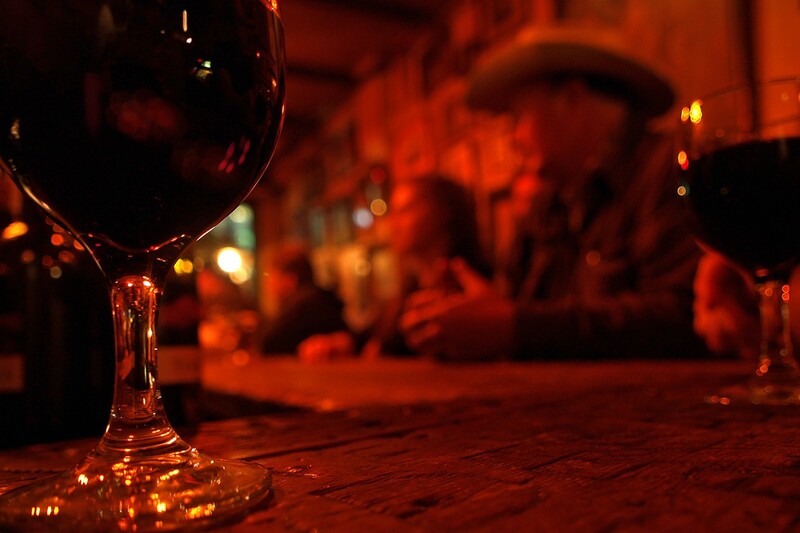 Come in for happy hour Wednesday through Friday from 4 to 8 p.m. for discounted liquor, beer and wine. 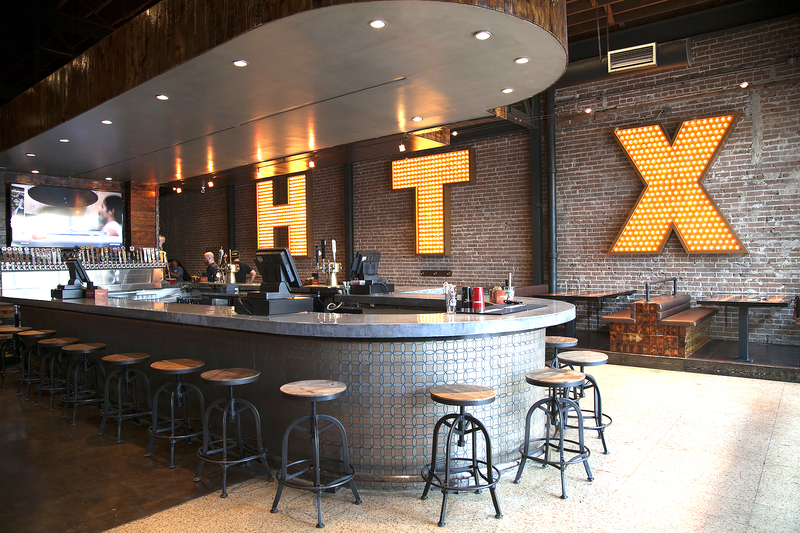 Bovine & Barley, 416 Main: People come from all over to take pictures with the large illuminated HTX on the wall at this downtown destination. That the name could have come from the Hipster Name Generator shouldn’t stop you from indulging in some of the 36 beers on tap. There’s also a sizable food menu, making this spot good for any time of the afternoon or night. Be sure to take advantage of the generous 3 to 7 p.m. happy hour every day of the week, with $5 bites and plenty of drink specials. Flying Saucer Draught Emporium, 705 Main: With over 100 selections on tap, and plenty of additional bottled selections, this is the hands-down beer mecca of downtown Houston. Servers are knowledgeable and will pick a brew for those who find themselves overwhelmed with the vast number of options. Join the UFO club and once you’ve tried 200 beers, a beer party will be held for you and your friends. You’ll also be immortalized on a saucer mounted to the walls or ceiling of the bar. Other features include a full bar, wine selections, and a full-fledged menu that includes hearty fare like Shepherd’s Pie and the “Reuben-esque” pastrami sandwich. A large projection screen and multiple TV’s make this a great spot to watch a game. 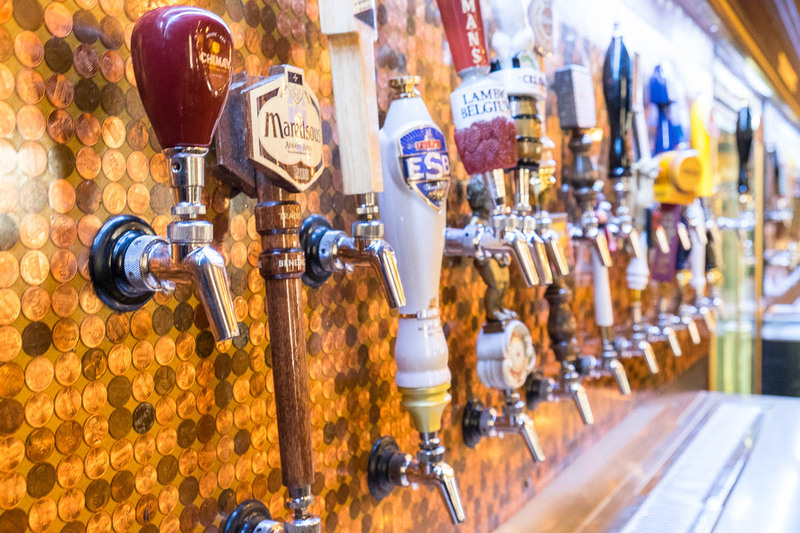 Drafts are discounted during their 4 to 7 p.m. happy hour Mondays through Fridays. Houston Watch Co., 913 Franklin: This is a destination with something for everybody. The old-timey feel of this bar is appropriate, as many Old-Fashioned variants are highlights of the cocktail menu. This venue is light on the wallet, too, with cocktails starting at $8, whiskeys at $5 and affordable local beers on tap. There’s no food, but there are plenty of nearby restaurants in case hunger strikes. La Carafe, 813 Congress: Dim lighting along with candles perfectly set the ambiance at this Houston haunt, the oldest bar in the city. Appropriate as the building has been around since 1847, more than 30 years before the electric light bulb was invented. You won’t find cocktails or spirits here, instead, they serve a large selection of modestly priced wines and beers. Make your way up the steep staircase to enjoy the surprisingly hidden balcony. As for calling it a haunt, many claim that the ghost of a former manager still drops in to check in on things every so often. This bar is cash only, but there is an ATM next to “Houston’s Best Jukebox” for patrons who were unaware. 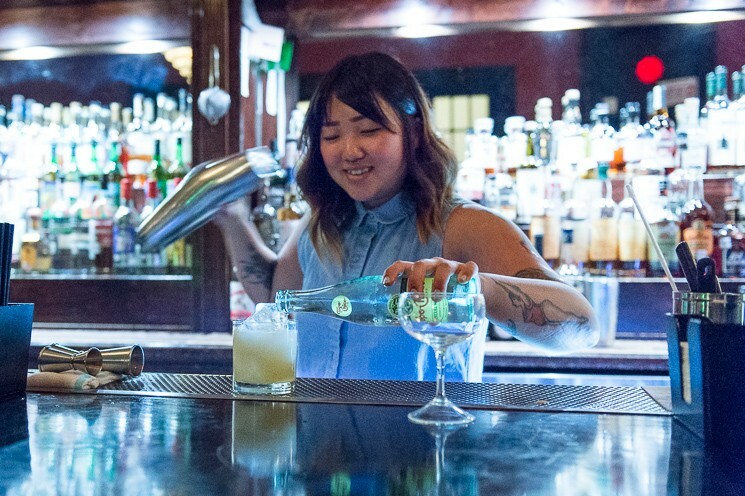 Moving Sidewalk, 306 Main: The staff at Moving Sidewalk, headed up by owner and competition-winning bartender Alex Gregg, takes great pride in their craft cocktails. Many of the ingredients, such as syrups, juices, sodas and bitters, are made from scratch. Gregg’s other company, Ice Age, handcrafts the huge, crystal clear cubes designed to keep your drink cold without watering it down. Keep your eyes open and you’ll see these used at top bars and restaurants throughout Houston. The list changes seasonally, but the House Old Fashioned is always available and includes rye whiskey, bourbon, piloncillo syrup and Angostura bitters, garnished with an orange twist. The Nightingale Room, 308 Main: If you like live music, this is your spot. Order a Godfather, made with bourbon, amaretto and angostura bitters, then gather the courage to hit the dance floor. Not a dancer? Then check out the vinyl collection that rivals many DJ’s libraries. It can get a bit cozy here, especially since there is no cover charge, so arrive early and grab a chair. The Original OKRA Charity Saloon, 924 Congress: Drink to do good at OKRA, where 100% of proceeds are donated to charity every month. Each drink ordered comes with a ticket that you can put in the ballot box for your charity. 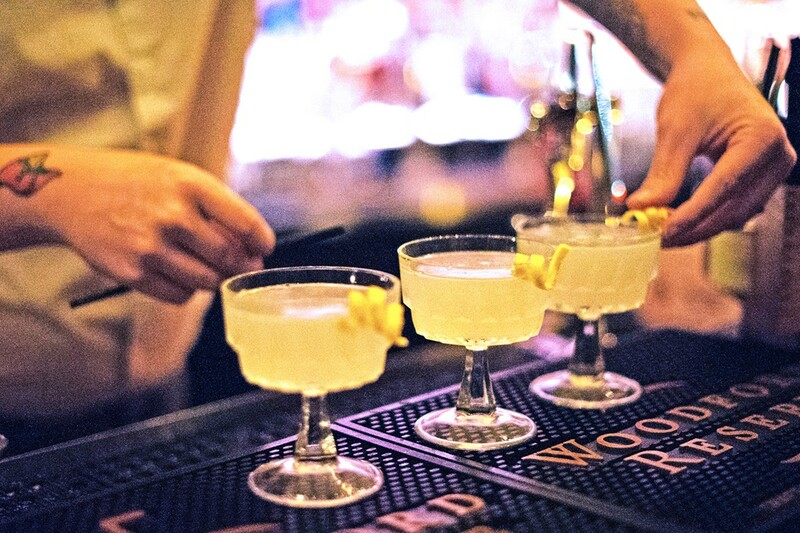 Whether Pimm’s Cup, French 75 or local beer, you might find yourself at their shuffleboard table long enough to cure cancer or pay for the master bedroom in a Habitat for Humanity house. The Pastry War, 310 Main: If your instinct is “Never again!” when someone mentions tequila then you might not plan on stopping in The Pastry War, which specializes in it—but we strongly urge you to reconsider. 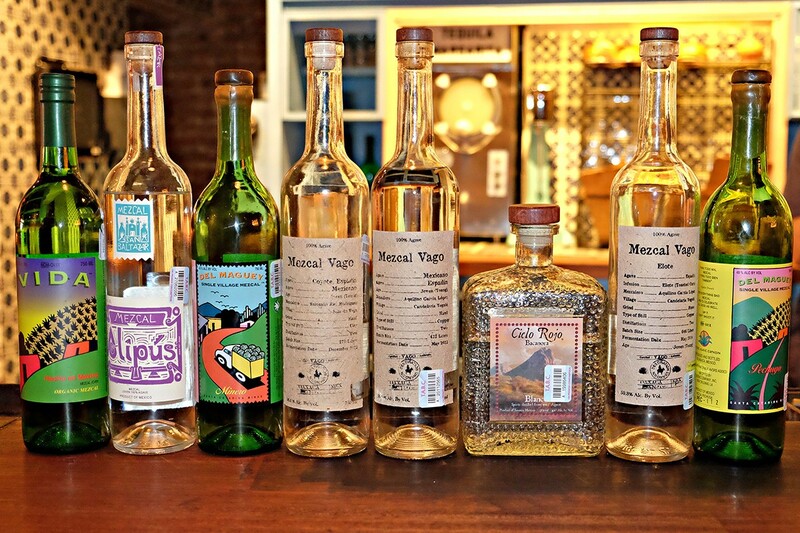 The small-batch tequilas (and mezcal) carried here are full of intriguing, natural flavors—nothing like what the big brands sell. The staff at The Pastry War is knowledgeable, helpful and will find a selection ideal for your tastes. Start an evening with their happy hour from 4 to 6:30 p.m. for discounted margaritas, Mexican beer and free pool tables. Public Services Wine & Whisky, 202 Travis: A visit downtown isn’t complete without stopping in to Public Services Wine & Whisky to browse their extensive list of whiskies and impeccable wine offerings. With both options available in smaller sizes (three-quarters of an ounce for whisky and three ounces for wine), customers can work their way through entire regions while keeping the bill at an acceptable level. This venue is a popular destination most evenings, and despite this being one of the larger venues on our list, you will want to arrive early to guarantee a seat on plushy antique chairs and sofas. Public Services Wine & Whisky is located in the historic Cotton Exchange building. 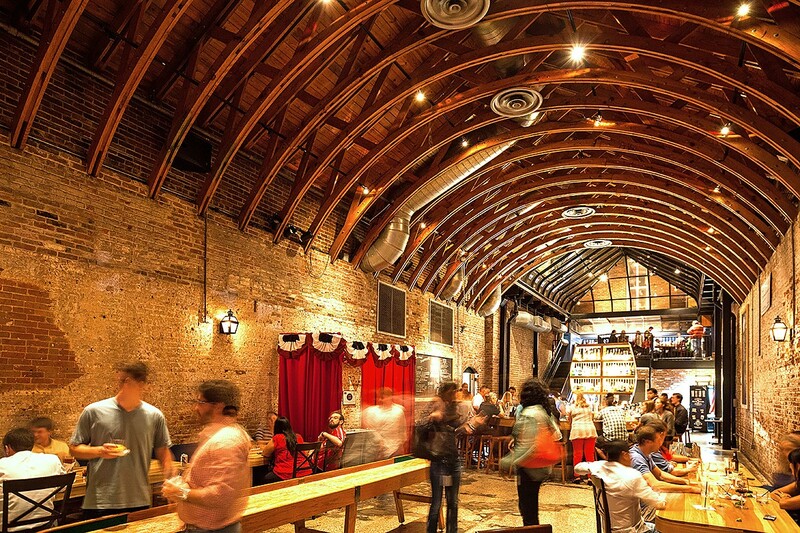 It’s adorned with ornately carved wood trim—even the ceiling, so it is also one of Houston’s most beautiful bars. Reserve 101, 1201 Caroline: Located directly across the street from House of Blues, this is a worthwhile stop both before and after a show. 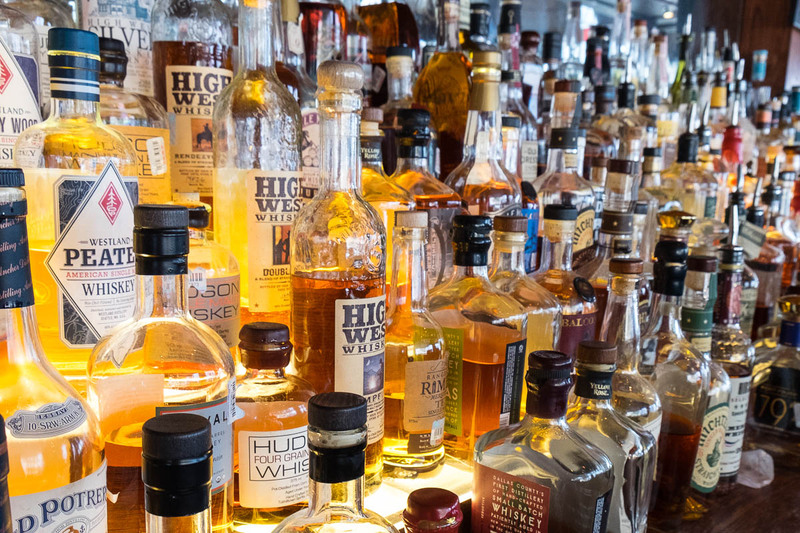 With over 340 whiskeys behind the bar, Reserve 101 has the most extensive collection in Houston and it is truly a sight to be seen. That said, they also make excellent, affordable cocktails, including the Black Barrel Black Eye, with Jameson Black Barrel whiskey, Campari, vanilla vodka and lemon juice, as well Now On The Main Stage with Brooklyn Gin, dry vermouth, Fernet Branca, simple syrup and cherry bark bitters served over an ice sphere and garnished with a twist of orange. Some of the whisk(e)y is equally affordable, but those with lush expense accounts (or just deep pockets in general) can indulge in rare offerings that sell for over $100 per shot. 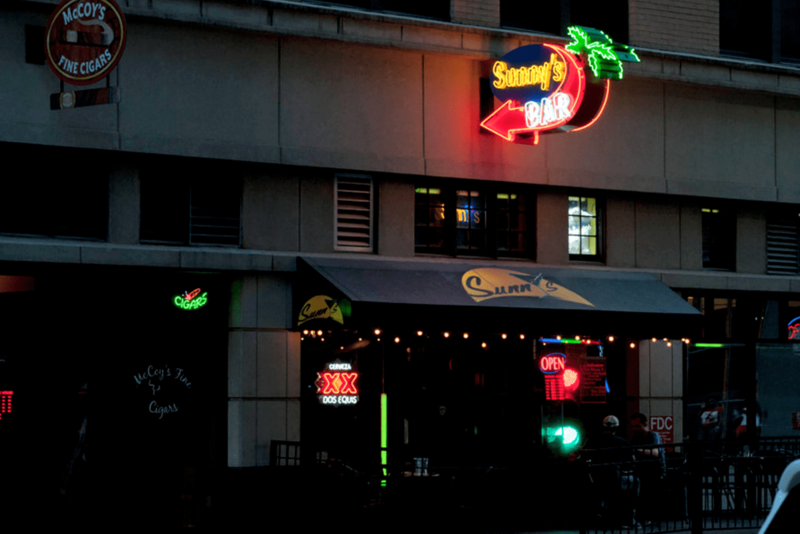 Sunny’s Bar, 902 Capitol: You won’t find fancy cocktails at this downtown dive, just a friendly staff and locals who treat you like one of their own. Enjoy free popcorn at the bar or head to the back room for pool tables, foosball and dart boards. Thursday’s karaoke night is a surefire hit, and be sure to try Sunny’s $1 Jell-O shots. Warren’s Inn, 307 Travis: Home of Houston’s heaviest handed bartenders, Warren’s is a no-frills Houston institution. The saying, “just enough Coke for color” might as well be the mantra here, so keep an eye on your intake. It’s easy to lose track of time while listening to Sinatra or many other options on one of the best jukeboxes in town. Warren’s fills up nightly, which makes this a perfect earlier in the day venue. The nightcaps here will have you hitting snooze on your alarm.